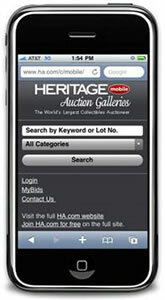 DALLAS, TX — Heritage Auctions has announced the launch of a mobile version of its award-winning Website, www.HA.com. Collectors now have the opportunity to search for, view and bid on any lot in any current Heritage auction from most any mobile device with a web browser from anywhere in the world where there’s Web service. "This is an exciting development for Heritage Auctions," said Paul Minshull, Chief Operating Officer of Heritage Auctions. "We’ve developed an easy to navigate, user-friendly platform for mobile users, one that lets you manage your bids and consignments no matter where you are on the planet." To reach the new Heritage Mobile site, users simply type in the URL www.ha.com and search by keyword; to limit the results to a single category, choose it from the "Category" dropdown. From there, once the list is up, the page functions like any other browser; click on any of the resulting search listings to examine an item more closely or place your secret maximum bid. Bids placed through Heritage Mobile are handled exactly the same way as bids placed through the regular Heritage Website – users will immediately be notified if they are the high bidder or if they’ve been outbid by another. Heritage Mobile also includes the popular Heritage MyBids page, which allows users to review bids at any time and to place another bid. "Heritage is always looking for ways to improve the user experience," said Minshull. "There are more innovations on the way, so check back often."